Color Cop is a multi-purpose color picker for web designers and programmers. Color Cop features an eyedropper, magnifier, variable magnification levels, 3 by 3 and 5 by 5 average sampling, snap to websafe, color history, and a 42 color complementary palette. 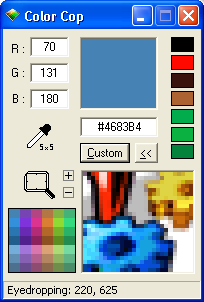 Color Cop will convert RGB decimal values to Hexadecimal color codes. Color Cop has color code support for HTML Hex, Delphi Hex, PowerBuilder, Visual Basic Hex, and Visual C++ Hex. 2.Magnifier This control works exactly like the eyedropper. Color Cop can be used to zoom in on an area of the screen. After zooming, you can click in the magnifier view to select a color. The plus and minus buttons can be used to change the magnification level before or after magnifiying an area. Qweas is providing links to Color Cop 5.4.5 as a courtesy, and makes no representations regarding Color Cop or any other applications or any information related thereto. Any questions, complaints or claims regarding this application Color Cop 5.4.5 must be directed to the appropriate software vendor. You may click the publisher link of Color Cop on the top of this page to get more details about the vendor.